Whether you're a freelance consultant, or a project manager at a big company, I hope you use some kind of tool to manage your projects, calendars and customers, other than sticky notes. We manage over a 100 projects a year in my department. A couple of months back, we've decided to have a customer-facing project management site per project, allowing us and the customer to closely follow the progress of our project and share documents and resources. I started digging into available solutions, with the assistance of someone who did a similar research in the past (thanks Matt - see Matt's profile on LinkedIn). In the end, we've both arrived at the same conclusion. Here are some of the alternatives I've checked, along with the reasons I didn't choose them. I hope you can benefit from this short description, and make the right choice for your projects. (Click on the screenshots to enlarge). Microsoft Project Server - essentially an online version of MS Project. Easy to use and integrate with other MS products. But raise your hand if you ever changed a tiny detail in your Project Gantt chart, only to find the entire chart dancing the rumba and moving the end date to January 3rd, 2099 at 3:10pm. Add to that the fact you need a per user license and host the server yourself. Customer facing capabilities a re limited. But if you're already using Project in-house, by all means install the server, so all documents are shared and synchronized. Also refer to Joel's anecdote about Project's usage within Microsoft. Price: you have to buy a license (per server and per user). Try-before-you-buy: if you have an MSDN subscription. 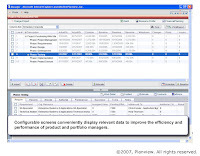 Planview Portfolio Management - Planview provides a set oif online tools and a suite to include them all (project, services and business process management). The problem is, my company is already using Planview as a time tracking tool and the UI and usability are so... miserable, I just gave this option the skip. Price: geared towards the enterprise, not individuals. This is a suite, so expect a hefty price. GoPlan - Very nice interface, very customer oriented. But response times were iffy. The whole site and attitude (and a .Org extension) kind of scared me about investing time and money in this site. Price: various plans, from $10/month for individuals, to $100/month for companies. Try-before-you-buy: a free plan allows you to manage up to 2 projects. 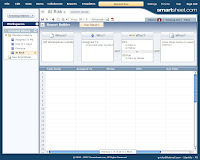 Smartsheet - other than the unfortunate name (see other sites who could have picked better URLs here), this site is one of my favorites. It comes as close as possible to an MS Project document or an Excel spreadsheet. The interface is clean and professional. The reporting module is very usable. 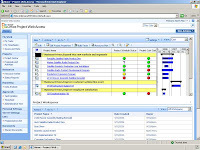 Many project templates are available. What detracted me was that this site doesn't lend itself to a customer facing environment. I'd definitely use it to manage my own projects, though. As an added bonus, the entire site is encrypted (HTTPS). 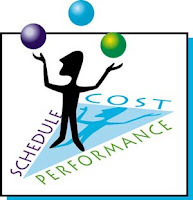 Price: various plans from $25-$150/month, based on number of projects and storage capacity. Try-before-you-buy: an account limited to 2 sheets is available for free. Basecamp - created by 37signals, this web application looks a bit spartan in interface, compared to the competition, but when it comes to sharing with customers, this is just what the doctor ordered. A very easy interface means integration effort and education are minimal. Uploading and sharing files is as easy as clicking a button. Managing to-do lists and milestones is a snap. Sending messages to the customers, or even chatting, are readily available (though for real time chat, you'd have to get a Campfire account - an extra charge. So don't discard your Live Messenger just yet). The calendar can be exported as an iCal format (an XML calendar format - read more here). Easily integrated within Google Calendar, or Outlook 2007. (If you have an older Outlook version, try RemoteCalendars, a free Outlook 2003 plugin that allows iCal integration). Every customer gets his own separate site. The URL is configurable. And HTTPS supported. Price: $12-$150/month, based on number of projects and storage space. Try-before-you-buy: a free account, limited to one project, with a URL, but no HTTPS. Basecamp was my recommendation 4 months ago. Today we have over 20 projects hosted on it. Customers generally like the idea and we're doing our best to educate them (for example, documents are uploaded to the site and not emailed anymore). Most people in the team have no problem with the interface and we're starting to see the level of details growing. But, by all means, don't just take my word for it. Try these different services. Register for free and manage a full project (mock or real) before deciding. Drop me a note with your recommendations. Good luck! Yes, SharePoint is not the most trivial system to use or manage. If it's a CMS system you're looking for, I'd recommend a Wiki - preferably an open-source one.